This vegan Tempeh and Black Bean Veggie burger is made with organic 3 grain tempeh and black beans. Quick, easy and ready in less than an hour. – True friends will genuinely get excited when you share good news. – Drinking 2 coffees and a quart of water before going for a run… not the smartest idea. – Not all Wawa stores around here have restrooms. – Porta-potties are probably THE grossest, most disgusting things in the universe. No flushing system, no sink and no hand sanitizer? Enough said. And last but not least, I learned (or remembered, rather) that no matter how many times you fail at something, eventually you will succeed, as long as you keep trying and don’t give up. 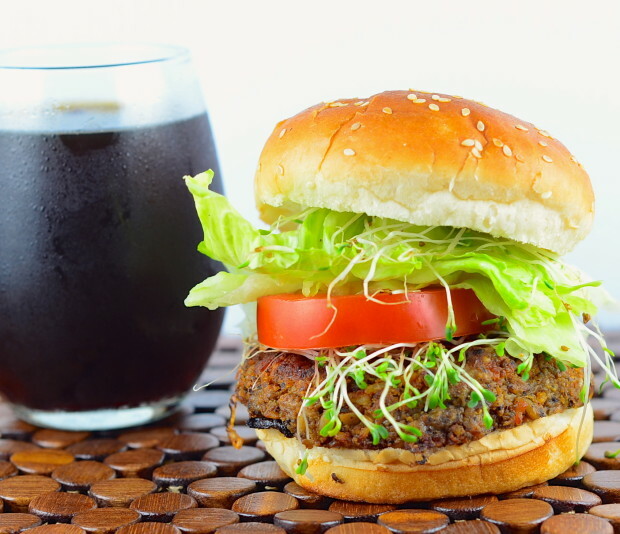 Did you like this Tempeh and Black Bean veggie burger recipe ? Leave us a rating! Preheat oven to 375F. Line a baking sheet aluminum foil and spray it generously with cooking spray. Serve on a bun with your favorite fixings… We love these with Home Made Hummus, Roasted Tomatillo Salsa or Romesco Sauce! IF YOU WOULD LIKE TO MAKE EXTRA BURGERS AND FREEZE THEM WE RECOMMEND FREEZING THEM ALREADY COOKED. Seems like your learned your lesson!!! I am very proud of you guys for not throwing in the towel but continuing to try until you succeeded, that is a true trooper! Have a great Memorial Day weekend! LOVE your bright and vibrant pictures! Me too! Always searching for the ultimate veggie burger. This sounds terrific. And looks great. So perfect for meatless dinner nights! I’ve made veggie burgers with beans as well and it turned out great! Hi, looks great. I have made both a plain tempeh burger and black bean burger, each tasting very good so a combo of both ingredients sounds great. Back in the mid 80’s early 90’s we produced Betsy’s Tempeh in Mich. for 9 1/2 years. Our tempeh was a best seller since we produced it without the use of plastic bags and sold the tempeh in both patty and grated form–great for chili, sloppy joe’s etc. Currently we are working on a tempeh incubator that would be used in restaurants and small shops producing healthy food for the local community i.e. artisan tempeh! Feel free to write with questions. So pretty! Those sprouts add such a unique and tasty addition to the burger! I also have been wanting to make my own veggie burger, but never get around to trying, thanks for doing the work, I can’t wait to try this. Looks like a delightful and filling burger! These look delicious – trying them tomorrow. Just one question – is there an alternative to broiling at the end? Can I do them in a pan on the stove instead? Just wanted to say that my boyfriend and I made this recipe last evening and it was fantastic! The almond milk + ground flax seed binder (I actually ended up using rice milk since that’s what I had on hand) was what made everything stick together and not crumble apart. Finally! Thank you for this recipe. It’s become a favorite! Great! 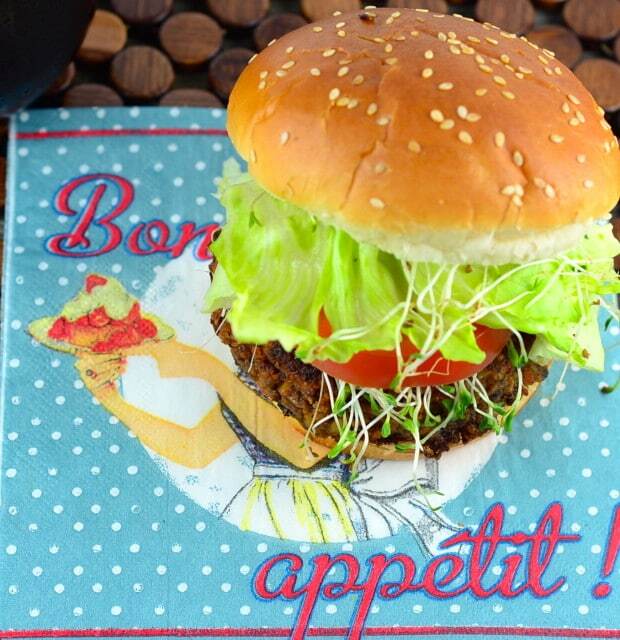 So glad we could help inspire you to try a home made veggie burger again. Just wanted to let you know that the Go Veggie Mozz is not vegan. This recipe is awesome! Like you, I’ve tried to find the perfect veggie burger and have not succeeded… until now. This is now my go-to veggie burger. Thank you so much for sharing! Thank you so much for taking the time to let us know how much you like our tempeh and black bean burger. We are so happy you are enjoying it! 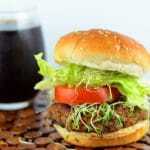 I have been looking for my “go to” veggie burger for a long time and this is it! Make sure you “cook” the tempeh first in about 3 cups of water or broth for about 20 minutes – this makes an incredible difference. Then proceed with the recipe. I used 1 cup of leftover canned Krogers’ Spicy Black Beans. I didn’t use any oil except for spraying the baking sheet with Pam before cooking the burgers. That’s a great suggestion. Thank you Caroline. 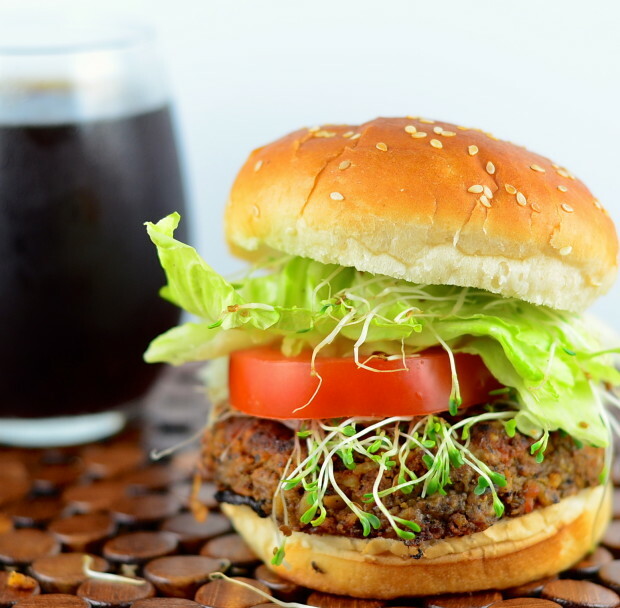 We are so happy you enjoy our Tempeh and Black Bean Veggie Burgers. When you freeze them already cooked how would you heat them up? Let them thaw, then warm them up in the oven at 350F for 10 to 15 minutes. No need to cook the tempeh first. Hope this recipe works for you! Do you think these would this work without the shredded cheese? 1. Flax egg (1 tbs ground flax mixed with 3 tbsp water) and some flour until it hold together. 2. Mashed potatoes also may work as a binder. Boil 2 potatoes and mash them with some salt and olive oil. I love tempeh!! Lightlife is the best I’ve got some in my fridge right now so i can’t wait to try these! We do too! Hope you enjoy the recipe! My husband and I both enjoy the flavor of these, but I cannot get them to stick together. I decided to revisit the comments section to see if anyone else had this problem and posted a tip, but it doesn’t look like it is an issue for others. Do you mash the black beans before adding them? We are not vegans but my husband has to watch his cholesterol so I may try subbing just the white of an egg for the flax seed + almond milk. Any other suggestions? Thank you for your comment. Sorry the recipe didn’t work out for you. Next time you make it, make sure to mash the ingredients with your hands really well, so they stick together. You can also mash the black beans before adding them to the mixture, but you’ll still have to mix everything together really well. Hope this helps! Please let us know if you have any more questions. Definitely a hit. Husband and 3 kids asked for more. We used a homemade lentil tempeh and these were great. Very nice grilled flavor, and, with the addition of the vegan mozzarella, a sort of meatiness that is missing from other veggie burgers. With regards to persistence in any topic, I am reminded of the Civil War general, Ulysses Grant whenever he repeatedly failed to win against the Rebels. He said to Abraham Lincoln, “I haven’t despaired of whipping them yet”. I will make the veggie burger soon. It sounds DELICIOUS!